Mariah Rasmussen, Teagan Parkin, and Lucy Dabbs make a few alterations to their robot at the competition Saturday. Apr. 2, 2017 1:00 p.m. Hundreds of high school students brought their A-game and coding knowledge to a robotics competition at BCIT Saturday. The annual Pacific Northwest regional championship brings student teams from across B.C., Alta., and Washington State. Each team worked on their robots for about eight months leading up to the competition. 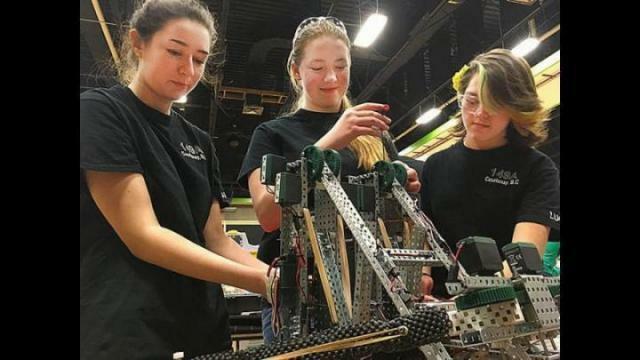 “It’s about five hours a week,” said Teagan Parkin, one of three members on an all-girl team from Georges P. Vanier secondary school in Courtenay, B.C. “We build the robot, we try the robot, compete with and basically rebuild it,” she said, laughing. Best described by a bystander as a mix between Hungry Hippo and volleyball, two teams would square off on a mini-court using their robot to lift blocks and throw them onto the opponents side. Each game involved two rounds: an autonomous battle where students had to pre-code their robot to move on its own, and a controlled one where students used hand-held controllers to direct the robot.